It is up to you to find the most Scarab relics! From the desert to the rain forest, from the Bermuda Triangle to Antarctica, these golden beetles are scattered across the world. Set up camps and mark Excavation Areas. Can you find the most Scarabs and uncover the mystery of Scarabya? 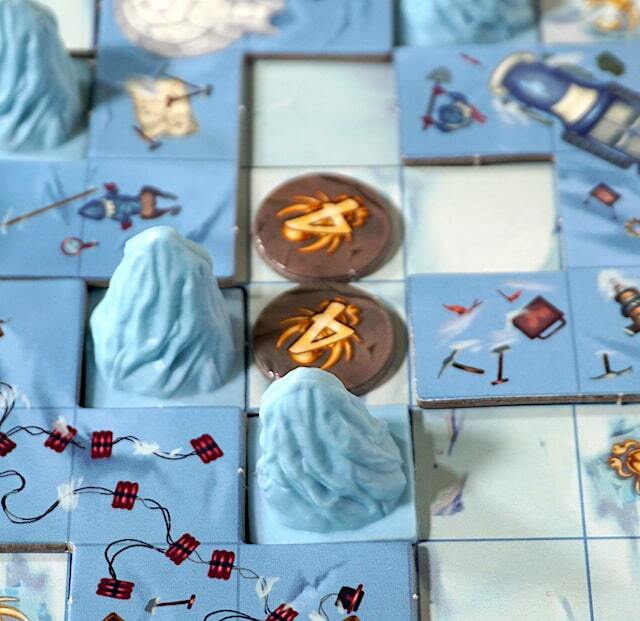 It’s a quest for scarabs across the world in Scarabya, a simultaneous play tile laying game for 1-4 players designed by Bruno Cathala and Ludovic Maublanc and published by Blue Orange Games. In Scarabya you’re an archaeologist seeking to find as many scarabs as possible. But just finding them isn’t enough! You’re rewarded for your efficiency in creating large excavation areas as well. 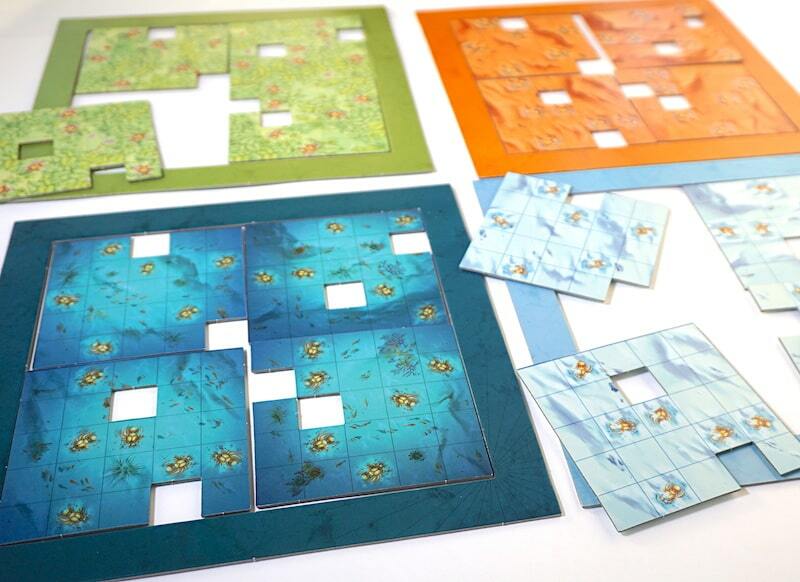 To set up Scarabya, each player takes a frame and the boards, tiles, and rocks that correspond with it. The youngest player is the Great Explorer who determines how to place the four board tiles inside the frame. Each other player orients their four boards exactly the same way. The players fill the empty squares in their boards with the rocks. Finally, someone shuffles the Mission Cards and places them near the Great Explorer. Scarabya is a 12 round game, because there are 12 Mission Cards that correlate with the 12 polyomino tiles. At the start of a round the Great Explorer draws the top Mission Card. Each card displays one of the 12 tiles each player has. When the Great Explorer draws a card, all players must place that tile on their respective player boards, trying to maximize points according to the layout rules. Remember, everyone’s board starts out exactly the same. Players must place the first tile of the game in the middle of the board so at least one of the sections of the tile is covering one of the central squares of the board. Every subsequent tile a player lays down must connect to another tile on a flat face. The tiles must lay flat inside the frame without going outside the frame or overlapping another tile. The rocks are natural obstructions that players must work around. If there is any way a player can place a tile, they must place it. If at any time a player cannot place the tile displayed on the Mission Card, they must discard that tile permanently. Players score by collecting scarabs. They collect them by creating a closed area of four or less squares. The barriers to this area can be tiles, the frame, or rocks. Once a player encloses an Excavation Area, the scarabs within it score. Each scarab is worth one point for every square of the Excavation Area. This means the maximum number of points an area can be worth is sixteen points (though scoring sixteen points is nearly impossible). Once the Great Explorer reveals the 12th Mission Card and all players have placed their last tile, the game is over. Each player then counts all the points from the scarab tokens they have collected. The player with the highest point total wins! Share the victory if you tie! The Scarabya rule book contains a One-on-One Variant and a Solo Variant. The One-on-One variant involves two players playing into the same Archaeological Site. This is a bit more cutthroat as the player who gets the points for an Excavation Area is the one who closes it off. In a way, it is like a Scarabya flavored game of Dots. In this variation, the player who went second may have positioned one less tile than the first player. If this happens, the second player gets one point for each scarab not in an Excavation Area. The Solo Variant flips the base game on its head. You’re tasked with covering all of the scarabs as the lone descendant of the civilization responsible for the golden beetles across the world. All tile placement rules still apply. If you cover all of the scarabs, you win! There are a lot of things I like about Scarabya. The rules are incredibly simple and immediately understandable. The simultaneous play is a great feature for younger gamers as well. Although our youngest is four, he could understand the basic rules and remained engaged since there wasn’t significant downtime between turns. Strategically, Scarabya does suffer a little from “inadvertent cheating”. Because of the simultaneous play, it’s tempting to be the Burger King to someone’s McDonalds. If you’re not careful, you may find yourself copying your opponent’s tile placement. The variants offered interesting variety to the core game play. The solo mode is a clever way to offer another twist without resorting to point threshold for an arbitrary assessment of strategic aptitude. Ultimately, though, Scarabya fell short for us. There just wasn’t quite enough depth to the game to supplant Karuba as the go-to game in this genre. The component quality was also a little bit disappointing for a Blue Orange game. The cardboard was thin, leading to a flimsy feeling game. 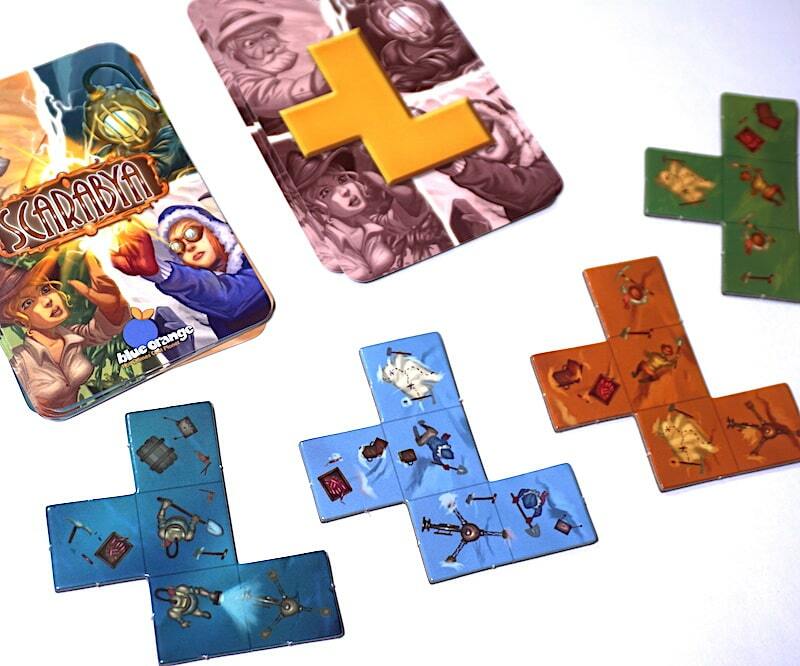 Despite its lack of depth, Scarabya offers colorful simultaneous play that is immediately understandable. We think the 8+ age rating could be dropped to 6+, and it excels at the younger ages. If you’d like to try your hand at hunting for golden beetles, you can pick up a copy at Amazon or your local Target for under 30 bucks. The Family Gamers received a promotional copy of Scarabya for this review. So I’ve been playing this game with my 2 and 4 year old in a variant we called “Squash the bugs” where their goal is to place all the pieces they can and lay them over the scarabs instead of coralling them. Its been a great puzzle solving game for them and I’m looking forward to teaching them the real version down the line. I would give this game an 8/10 for playing with littles. I like karuba, perhaps I’ll try turning that into a “grab the treasure” game.